As a writer, I am always learning. I think that’s what I love most about writing — the learning never stops. I am either learning something new about myself and writing as I write, or I stumble across new information as I am looking to learn more about writing. This time it was the latter. Recently on Twitter, I ran across a book recommendation for plotting that I loved so much I had to share it here. 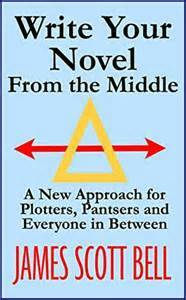 Write Your Novel From The Middle: A New Approach for Plotters, Pantsers and Everyone in Between by James Scott Bell is must read for anyone serious about writing. This book goes into detail about why writers should start from the middle of a story instead of the beginning or end (who would of thought!). And how finding a character’s “mirror moment” is essential to true character development. I definitely believe character development is a key element in a story. The more a reader can relate with a character and feel for a character’s journey, the better the book becomes. And this method certainly will help with that! This book also helped me realize that I’m a Tweener (I always thought myself a straight up Pantser). I do love writing by the seat of my pants. That’s how I get some of my best ideas, but I also know where I’m writing too as well. I have a loose idea of events I need to reach and about where I need those events to happen. Also, I find already knowing my ending is a necessity to writing, even if I don’t know specifics. Just having a good idea of where I need to stop gives me a clear goal to reach for. But after reading Bell’s book I have an even better way to approach my writing. Start in the middle and Pants my way to the beginning and end. I’ll still have those events and goal posts to reach, but I think it will be far easier to get there knowing exactly what the character’s journey should entail.